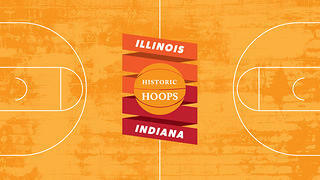 Welcome to our Historic Hoops series, where we offer a guide to historic places related (at least tangentially) to a televised men’s or women’s NCAA basketball matchup each week throughout the 2015-2016 season. Whether you’re a die-hard fan or simply stuck watching with your significant other, we’re here to assist your viewing experience with some historic context beyond the hardwood. Opening Tip: OK, so neither team is currently ranked. So what? Indiana is arguably the best basketball state in the Union (anyone seen the movie Hoosiers?) and Illinois is no slouch either. This is Big 10, Midwest basketball at its finest. But the real star of the show? Assembly Hall. Assembly Hall seats more than 17,000 fans, but somehow still retains the feeling of a gym. Where do I start? 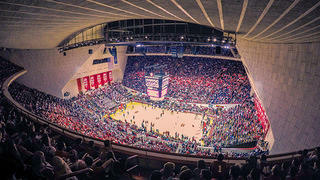 Assembly Hall is not the biggest, or the oldest, or the most storied venue in the college game, but it’s just…awesome. Put it this way: There’s a reason why they call it the Carnegie Hall of college hoops. With its steep seating and curved roof, it’s nothing if not unique. Even though it holds more than 17,000, its close quarters, understated court design, and general lack of all the usual nonsense that clutters up an arena gives it an unbeatable old-school feel. And the fans? They’re as good as they come. This state lives for basketball, and though Indiana is also home to storied programs like Purdue, Butler, and Notre Dame, IU is the state’s most beloved team. The Modernist Assembly Hall opened in 1971. 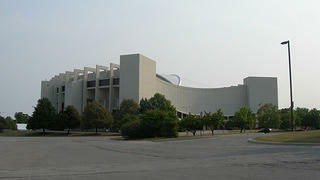 Assembly Hall was designed by New York-based Otto R. Eggers and Daniel P. Higgins. The duo had previously been directly involved with the design and construction of the Jefferson Memorial in Washington, D.C. 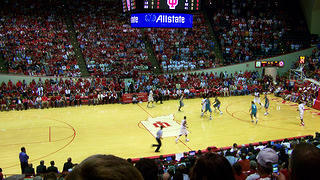 Assembly Hall is currently undergoing a $40 million renovation. The project is expected to be completed in late 2016. Basketball is the most important sport in Indiana, and it's not even close. Buzzer Beater: As far as anyone can tell, the term hoosier dates to the early 1800s as a way of identifying inhabitants of Indiana. Apparently, the dwellings of early settlers there were called hoosher nests. The meaning of the word is said to lie in the self reliance and bravery of those who settled the area. And-1: Syracuse visits #9 Duke at Cameron Indoor Stadium on Monday, Jan, 18 at 7:00 p.m. on ESPN. Cameron Indoor is known for perhaps the most raucous crowd in the game, but the 1940 Gothic structure is also one of the most storied venues in the land.